Extraordinary Dogs: Walk the Dog Campaign! Dogs are not only great companions but they can be great motivators when it comes to physical activity. A daily walk is good for you good for your dog but unfortunately we don't do it enough. That's why RSPCA teamed up with the Heart Foundation to encourage Australians to get out and get active with their best mate. Just 30 minutes walk every day can help reduce the risk of heart disease in people and keep your pet healthy too! Why is exercise important for people and their pets? Physical activity has also been shown to facilitate better stress management, alleviate depression and anxiety, strengthen self-esteem, enhance mood and boost mental alertness. For our pets, obesity is associated with a number of medical complaints including osteoarthritis, cardiovascular disease, liver disease and insulin resistance. 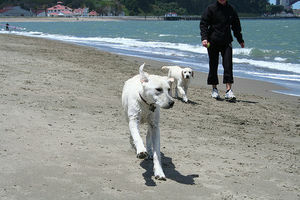 Regular exercise is vitally important for pets too and is an essential part of being a responsible pet owner. Regular walking can help you and your dog maintain a healthy weight, build endurance and muscle tone. Finally, regular walks make dogs very happy - they love to check out the sights and smells and will really look forward to spending this time with you. A dog that doesn't receive sufficient exercise can easily become bored or destructive. Million Paws Walk - the BIG day out for animal lovers! For further information on this annual fun fundraising event contact your State based RSPCA. It's a weight loss project for pets. It sounds interesting.